Proposed changes to the furniture fire and flammability regulations are not viable and leading trade associations and manufacturers are against them, according to a Conservative MP. 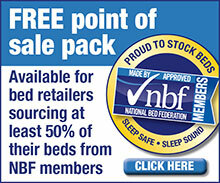 National beds specialist Dreams will open a new format store in Romford tomorrow morning (28th Nov). Harveys and Bensons for Beds owner Steinhoff is to enter the fashion market after agreeing to acquire one of the largest non-food retailers in the Southern Hemisphere. The Home directorate was top of the tree as Christmas gifts and decorations drove sales at John Lewis in the seven days to 22nd November. Home improvement retailer B&Q said sales of showroom merchandise — its kitchens, bedrooms and bathrooms offer — declined in its third quarter. Two-store independent Cookes Furniture said it built sales momentum in 2013–14 and has seen top and bottom line improvement in the first six months of its new financial year. Yorkshire beds group Harrison Spinks has launched a dedicated Contract division headed up by one of the sector’s most experienced executives. Paris, FRA. — Simmons Bedding Group owner Cauval Industries has hired the former head of IKEA France Jean-Louis Baillot as chief operating officer. Upmarket retail chain Sofas & Stuff — the brainchild of Sofa Workshop founder Andrew Cussins — is on the march with new smart showrooms opening across Britain. Belgian carpet producer Lano has agreed to buy the broadloom carpet business of compatriot and rival manufacturer Bajong.